Mandarin Orientals Fabulous New Resorts opens its doors,the Mandarin’s luxury doesn’t shout, it whispers . Plus Maggie’s Adventures in Marrakech – Going back in time …..I went out to Marrakech for a conference, I absolutely loved it.It is like going back in time and at times felt like an Indiana Jones movie set! 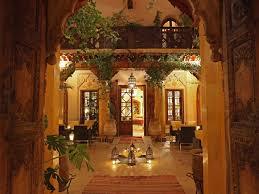 When I go back and I am sure at some point I will I would stay in one of the Riads in the Medina Quarter. They are full of character and you know you are definitely in Morocco. 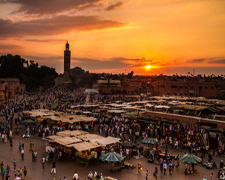 Marrakech is great for a City break or a gateway to the rest of Morocco if you want to do a fly drive. From Marrakech you can do some great day trips, visit the Atlas Mountains which you can see in the distance with snow on the peak, take a desert tour. Or just stay in this fascinating City, enjoying the sights, sounds and smells as you wander around. Jemaa el-Fnaa is the huge square in the centre of the Medina, full of food stalls, street performers, even snake charmers. It is really busy and noisy at night with the smells of all the different foods wafting in the air. 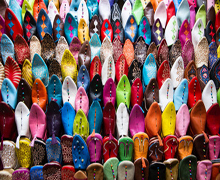 During the day you can wander around the souks, every type of colourful spices piled high, jewellery makers working as you look at them, material being dyed in big stone tubs, fabulous leather slippers, bags, belts etc. All types metal ware, colourful lanterns, we even saw one stall that had metal chastity belts hanging up with great big keys on the front !!! 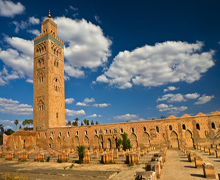 The kingdom of Morocco is steeped in history, has a rich tradition of art and culture and is a land of many contrasts. 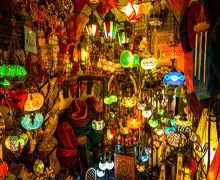 From the wonderful beaches stretching along the coast, the rural villages of the High Atlas Mountains to, of course, the popular city of Marrakech, we have the knowledge and expertise to assist you in finding your Morocco…..
With temperatures now beginning to rise, this is the perfect time to think of a short break or even a longer stay as many of our hotels and Riads have some fabulous offers. In July the Festival ‘National Des Arts Populaires’ takes place in Marrakech, where locals from surrounding villages travel to town for a festival that celebrates traditional music, theatre, poetry and art. It begins with a rather grand display in the Djemaa El Fna, the city’s central square and lively hub normally home to story tellers, snake charmers and the like! 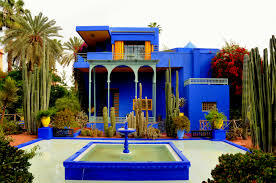 Apart from visiting and bartering your way through the souks, how about visiting the Jardin Majorelle – originally the home of the landscape painter Jacques Majorelle, in 1980 Yves San Laurant saved the gardens from becoming a hotel complex and made them into an inspiring, relaxing green oasis you can wander around at leisure, enjoying the bursts of colour from plants and flowers alike. If all of that sounds like too much effort, book yourself into your hotel’s Hammam and let yourself be pampered! Or for that local flavour and something to try on your friends and family when you get home, how about learning about the flavours of Morocco with a cooking lesson? You will find out just how to use all the right spices in the traditional Moroccan dishes and you don’t even have to leave your hotel or Riad! Lessons can last anything from half a day to just for an hour? 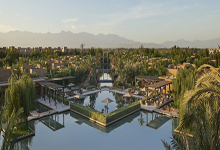 This truly amazing new hotel has just opened .With the Atlas Mountains as a backdrop and a series of serene ponds as a centrepiece, Mandarin Oriental, Marrakech lies nestled in 20 hectares of olive groves and landscaped gardens, beautifully scented with jasmine, night-blooming cestrum and over 100,000 fragrant roses. Only 10 minutes from the city’s famous Medina, this elegant, contemporary resort feels a world away in terms of serenity, with just 54 luxurious villas and 9 spacious suites, a world-class spa and excellent dining.Some 220 staff members support an exceptional array of facilities including three restaurants, indoor and outdoor pools, access to two golf courses, cooking classes and a range of customised tours and activities. The 19,0003 sq ft spa deserves its own review with its cathedral-like brickwork interiors, male and female hammams, six spa suites, a jade-coloured pool, yoga studio and fitness centre. Personal training, bike rides, jogging excursions and nutritional programmes are all part of the package. A must for any special occassion . This boutique hotel is a real gem. Hidden behind centuries old high walls, guests will find a beautiful garden surrounding the pool where sunbeds and umbrellas are dotted around. Walk among the orange trees to discover small fountains, terraces and delightful corners to relax and enjoy a book. You are transported in to a wonderfully peaceful haven where the gardens come to life with the sound of bird song, the pool beckons and the restaurant tempts. 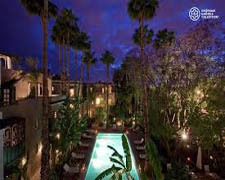 For a truly luxurious stay in Marrakech this hotel oozes style and sophistication. It is always on the top ten hotels in the world list.Stroll around the magnificent gardens, where at the moment you can marvel at the exhibition of various sculptures by the artist Kibari. From the boutiques, spa, restaurants and bars it will be hard to leave this oasis behind to explore the wonders of Marrakech medina and city just moments away. 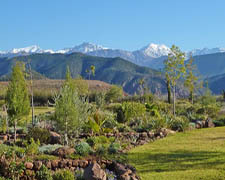 Two lovely properties are situated in the foothills of the High Atlas Mountains and offer a different, both unique and authentic, experience. The welcoming staff here are employed from the surrounding villages which obviously helps the local economies. 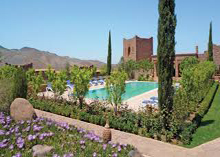 Kasbah Tamadot , owned by Sir Richard Branson,bought on his first balloon adventure.The exquisite luxury hotel is set within a magical walled estate, which installs a charming ambience. Take in the breathtaking views from the rooftop and pool terraces where you can enjoy local and international cuisine It has fabulous views over the valley with just 28 guest rooms and ten berber tents, six of these have a hot tub on the terrace – perfect for a romantic getaway or a break from the busy centre of Marrakech. Kasbah Angour , is a more relaxed rural boutique property. Designed and built by the owner, Paul Foulsham, this Berber castle imitation has been lovingly created on the top of a hill that looks out on to Mount Angour – hence the name. There are some fantastic walks in the local area, so for the more energetic, ask the hotel for picnic and away you go!